When it comes to horror comedy, no film franchise nails it quite like the Evil Dead franchise. 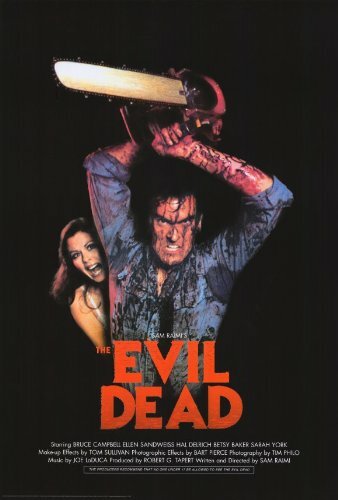 It all began in 1981 with The Evil Dead, an indie horror film with the miniscule budget of $350,000. Five college students take a trip out to a rural cabin in the woods but accidentally discover a mysterious book. This book is the Necronomicon, or, the book of the dead. After playing a tape where a passage is read out loud, the kids are attacked by demons who torture and possess them. Ash (Bruce Campbell) ends up as the lone survivor and, eventually, the hero of a franchise. The Evil Dead is one of those special horror movies that was born out of pure passion. The sets, the effects, it’s all so genuine and real. It’s a movie where it’s clear that everyone involved had a lot of fun making it and that’s what makes the horror genre so special. The sequel, Evil Dead II (1987), spends the first 15 minutes actually retelling the story of the first film and then goes on to become a proper follow up. Ash continues fighting off the demons but this time the gore, effects, and comedy are quadrupled. Ash’s hand is possessed, so naturally he cuts it off with a chainsaw. Then, he replaces his lost appendage with that same chainsaw, just to give you an idea of what kind of movie this is. It’s an absolutely crazy horror comedy and one that literally can’t be forgotten. Ash himself is a much more memorable character here. He loses his mind, cracks one-liners, and gets sprayed by all kinds of strange fluids. In Evil Dead II, Ash becomes one of the most famous horror movie heroes of all time. The series goes full comedy with the third film, Army of Darkness (1992). In it, Ash travels to the past and fights off the dead in the middle ages. He goes on a quest to stop the demons once and for all, all while trying to selfishly find his way back to his own time. This film is ridiculous. Ash gets attacked by tiny versions of himself, fights his evil twin, and blows up an army of spooky, scary skeletons. All three films are directed by Sam Raimi, director of the original Spider-Man trilogy. Raimi used camera tricks that he’s now known for to make memorable and creative scenes. There’s a shot where something is chasing Ash through a house from the camera’s point of view and it actually breaks down doors. There’s another shot where the camera busts through a car window. These kinds of techniques would later be used in the Spider-Man films. The Evil Dead trilogy is my favorite horror trilogy. It’s just fun; the filmmakers and actors had such a good time making it and therefore audiences have a good time watching. There is also a TV show, Ash vs, the Evil Dead that follows up the movie trilogy, as well as a 2013 remake that takes a more serious approach. I recommend watching all of it if you can, but start with the original trilogy. To me, it’s what the horror genre is all about: having as much fun as possible while making a movie. In a word, it’s groovy.